This pasta with tomato and ricotta cheese is a fantastic alternative to the tomato sauce classic. Ready in just 30 minutes, this recipe is a super-creamy pasta ideal for weeknight meals! Use your favorite type of pasta. The sauce is the star here and will work with whatever you prefer. Per Serving: 425 calories; 21g fat; 44.1g carbohydrates; 16g protein; 23mg cholesterol; 430mg sodium. 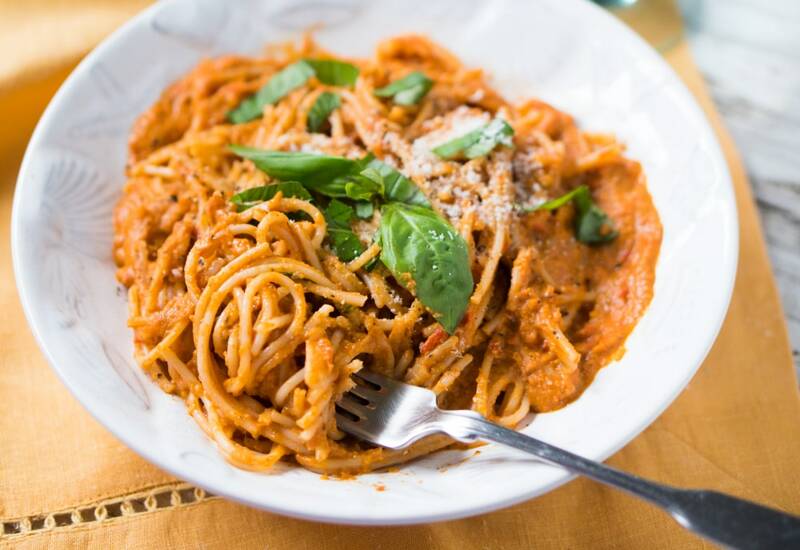 This has to be one of my favorite pasta dishes on the site so far. It's just your basic spaghetti recipe, but with the addition of creamy ricotta. I left out the ricotta and served my vegan friend first before adding it in for myself. Definitely a winner on both sides. This was all kinds of yum! Added some leftover meatballs and this was a hit! I cut some corners and used store bought tomato sauce. Love this recipe, the ricotta cheese and tomato sauce mixture is fantastic. Next time I may stir in some spinach. Yummm. I used orecchiette pasta, my favorite! It sopped up the creamy sauce perfectly. I don't eat pasta often, but this is definitely one of my top three favorites. I've tried a few dishes lately with ricotta cheese in the sauce. Definitely feel like I've been missing out all this time! I used spaghetti pasta and added chicken, and it was so good. I can't say enough good things about how delicious the sauce was.